Sergey Polyanichko was born in Rostov-on-Don. At the age of 11 he entered the Special Music School for gifted children at the St. Petersburg State Conservatory in the class of French horn (Professor V. Buyanovskiy class). He graduated from St. Petersburg State Conservatory (Professor A.E. Glukhov class), class of French horn. While studying at the Conservatory, he was simultaneously engaged in opera and symphony conducting the St. Petersburg State Conservatory (Professor I.A. Musin class). 2003. Graduated from St. Petersburg State Institute of Theater and the St. Petersburg School of Television. 1999-2002. Worked as an anchor man on St. Petersburg Television (VGTRK – Channel 5), TV6. 2003. Qualified as the winner of the International French Horn Competition. 2005. Master class of Professor A. Polyanichko (St. Petersburg). 2006. Master class of Professor V. Ponkin (Moscow). 2006. Master class of Professor Jorma Panula (St. Petersburg). 2007. Master class of Professor Jan Latham-Kenig (St. Petersburg). 2007. Intern at Opera and Symphony Conducting Department in State Conservatory in St. Petersburg (class of Professor V.A. Chernushenko). As a horn player, Serge worked with many orchestras:Orchestra of St. Petersburg State Conservatory, St. Petersburg State Academy, Symphony Orchestra, Radio and Television Orchestra of St. Petersburg, Russia’s National Student Orchestra, Orchestra Academic Capella of St. Petersburg, Orchestra of the Mariinsky Theater. Sergey works as a guest concertmaster of horn symphony orchestras of “Heinola Simfonietta” in Finland, “Nordicsymphony” in Estonia, and the “Philharmonic Orchestra of Santiago” in Chile, performing in the ensembles and solo concerts. Often on tour in Finland, Denmark, Estonia, Latvia, Germany, Austria, France, Switzerland, Spain, Italy, Israel, Britain, Chile, China, the United States. 2006. 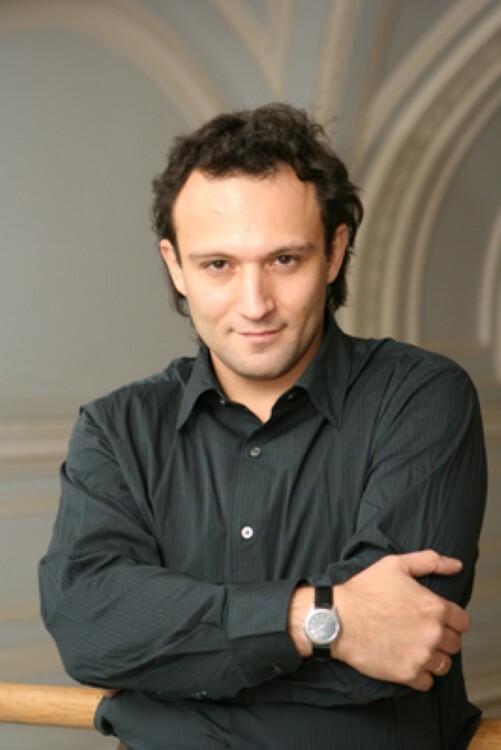 As a conductor, participated in the productions of the opera «Boris Godunov» (Opera de Monte-Carlo, January 2006.) and the opera of P.I. Tchaikovsky «Mazeppa» (Welsh National Opera, April-May 2006). 2008. As a conductor, participated in the production of the opera «Eugene Onegin» (Welsh National Opera, January-February 2008). 2008. Organized and headed a symphony orchestra «Nevsky», which performs at festivals, performs recordings for films, conducts master classes, and accompanies Russia’s pop-stars. 2006. Organized and headed “The Horn Orchestra of Russia”. 2007-present. Director of the «Center of the horn music».